We are now on the SECOND week of our #TPTSellerChallenge! 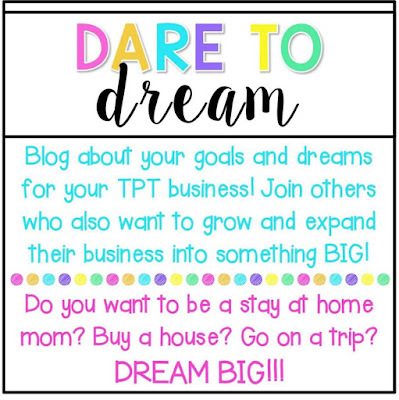 This week our challenge is to blog about our dreams! What pushes you to basically work two jobs every day? Do you have any end goals for your TPT journey? 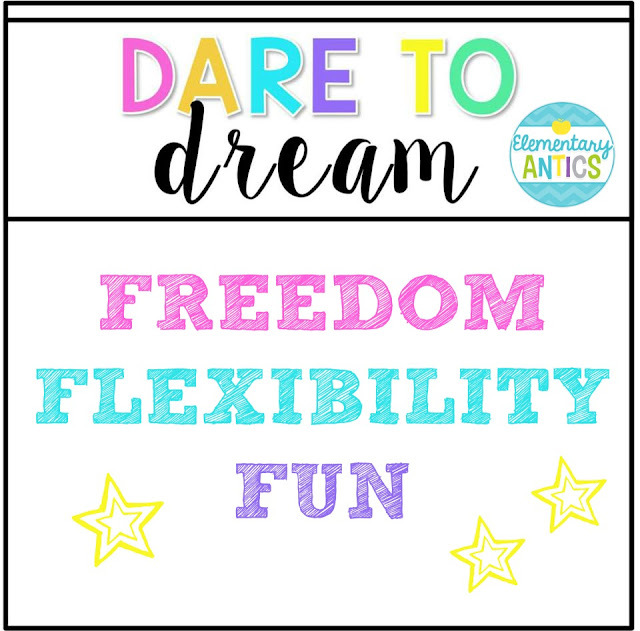 So with that being said, to get down to it, my dreams and goals for my TPT business are freedom, flexibility and fun! I think FREEDOM and FLEXIBILITY go together. Teaching is fantastic, but after just having my second baby this May I am now taking some time off to be a stay at home mom. Obviously, right now my TPT store doesn't bring in the same income that teaching did for me, but I love that it gives me the freedom to be able to stay home with my kiddos and still earn some income for my family. One day, I would love to totally replace my teaching income with my work on TPT. Talk about freedom and flexibility in life! I've got a LONG way to go, but I do know that being your own boss is pretty awesome. Also, I love teaching and I love that TPT lets me stay in loop of it all and stay in the education world even when I'm not in the classroom full time. Next up, FUN! Hello, of course I want to have fun! I would love to save for an amazing family vacation in a few years when all the kiddos are old enough to enjoy a good time. What's up on my agenda you might ask? Well, I seriously want to go on a Disney Cruise! Being from Florida my family loves Disney and I've heard some awesome things from EVERYONE that has been on a Disney cruise. Also, further down the road- Hawaii! My hubby and I got hitched in Honolulu and it was THE best decision ever to have a destination wedding. We loved it there! I absolutely want to take my whole family back one day- maybe for our 15th or 20th anniversary if we are lucky. What are your dreams? Link up your post at Third in Hollywood, Teach, Create, Motivate, Sparkling in Second or Peppy Zesty Teacherista! I love how simple, yet how fulfilling your dreams are! Love the alliteration of your dreams! Makes my teacher heart happy! Freedom, Fun, and Flexibility really says it all doesn't it? Good luck! Those are 3 great Fs! Freedom & flexibility are what I aspire for in being my own boss. May you enjoy the time home with your sweet new baby and have a future where you have the freedom and flexibility. Good luck!